Speaking from his exile in 1720s Britain, François-Marie Arouet today spoke out as to the turn that human discourse has taken and said that he wants to set the record straight over his reputation being continually embroiled in support of other people’s arguments. Voltaire was taking a rare opportunity for an 18th century philosopher to sample some of the extents to which the hard won freedoms of expression, so pioneered by the enlightenment movement of the late 17th century, had come to manifest themselves some 400 years later. “I don’t mind being used as a totem for challenging established authority. That was, after all, my bag whilst I was alive,” said the Enlightenment essayist. “But my reputation is at stake when I am mis-attributed by an author who proceeds to call everyone else a ‘cockend’. M. Arouet said that he truly admired the Internet and the manner in which ordinary people across the world could freely exchange information and ideas, but wondered as to the path it was taking. 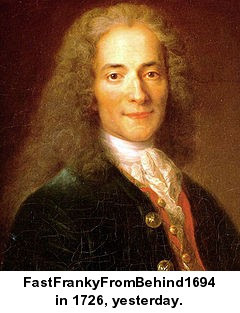 Voltaire, who is credited with using over 170 pen names, also expressed dismay at what he sees as the quality of the pseudonym in the 21st century and its usual reliance on sexual metaphor. However, despite all his misgivings about the level of discourse, he said that the immediacy of locating and sharing information was intoxicating.